Attendees gather at Nova Place for the opening of CoLab18. Photo by TH Carlisle. 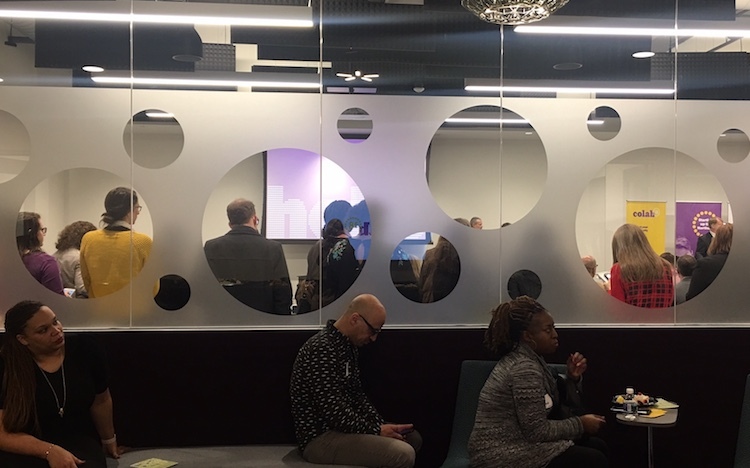 North Side residents have a new home: CoLab18, a 4,600-square-foot space inside tech hub Nova Place, opened today as a public resource for learning and collaboration among the North Side’s 18 neighborhoods. 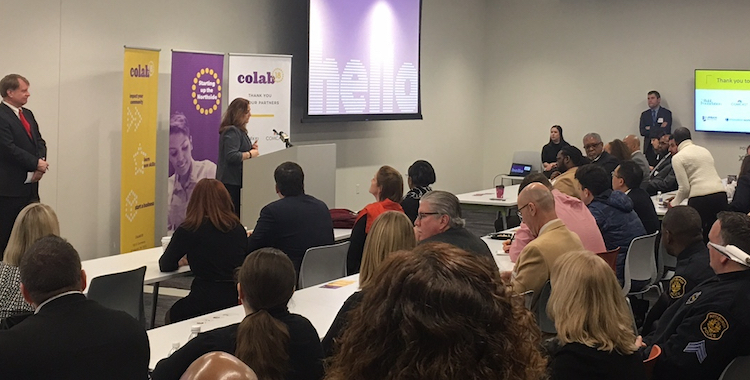 “CoLab18 is a state-of-the-art digital literacy laboratory that’s designed to create a space for North Side residents to experiment and solve problems, and get the skills they need to improve their own condition in whatever way they want to see that happen,” Diana Bucco, president of the Buhl Foundation, told NEXTpittsburgh at today’s ribbon-cutting. 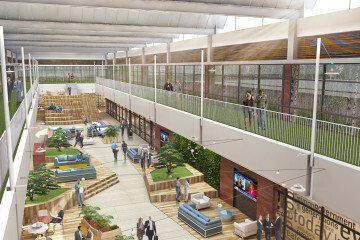 North Side residents will have access to programming from a host of educational and networking partners, along with multipurpose spaces, lounge areas and conference rooms accommodating up to 150 people. The space also comes equipped with free Wi-Fi and gigabit-speed broadband service installed by CoLab18 partner Comcast. Nova Place began offering a community gathering place early last year. The opening of CoLab18 takes the process one step further. Partners will be recruited by the resident-driven initiative One Northside, launched in 2014 as a “large-scale effort to create a shared agenda for progress.” They’ll focus on four areas: community collaboration, education, digital engagement and workforce development. At the CoLab18 opening ceremony, an overflow crowd watches on video from one of the multipurpose spaces. Among the first programs planned: entrepreneurship training by Riverside Center For Innovation and networking events hosted by Innovation Works and Alloy 26, a co-working space located at Nova Place. 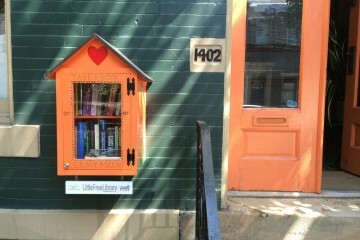 More than 40 additional agencies have also pledged involvement, including Allegheny Partners for Out-of-School Time, United Way’s “Be A Middle School Mentor” program, BizFIT Construction and Citizens Bank.